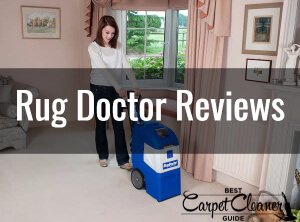 Rug Doctor Reviews: Is it the Best Professional Carpet Cleaner? You are here: Home / Rug Doctor Reviews: Is it the Best Professional Carpet Cleaner? So which professional carpet cleaning model would we recommend? If you have a lot of carpets to clean or you need to clean your carpet often, then a professional carpet cleaner may be an option worth considering. 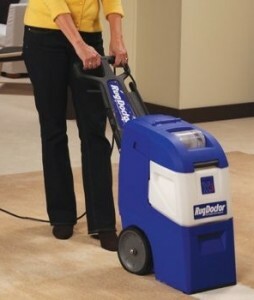 Professional carpet cleaners are very similar to the ones you can hire and are often the same models. They tend to have larger cleaning tanks, more cleaning heads and the ability to dry your carpet quicker than normal upright carpet cleaners. There are however, two distinct disadvantages of professional carpet cleaners. First, they’re not cheap! The least expensive one will cost around £450 which is way more than the average upright carpet cleaner. If on the other hand you are regularly paying £30-£50 to rent a similar carpet cleaning machine then it does not take too long for the investment to pay back. The second issue is size. They are big machines and will take up a lot more space than upright carpet washers; definitely one to be stored in the garage or shed rather than the understairs cupboard! The two best selling professional carpet cleaners are the Bissell Big Green and the Rug Doctor X3. As if to challenge Bissell in the colour stakes, Rug Doctor have also released a fun red Deep Carpet Cleaner. Read our reviews below to find the winner. If you have ever hired a carpet cleaner then you will be familiar with the Rug Doctor X3’s red-coloured cousin. They are a familiar sight in most UK DIY stores and supermarkets and this gives some confidence as to their build quality, cleaning performance, and durability. The X3 is an almost identical to those Rug Doctor rental machines and makes a sensible long-term purchase if you are regularly cleaning carpets. It’s also cheaper than the Bissell Big Green and for that saving you could buy yourself a handheld carpet cleaner for emergency spot cleaning (or indeed, Rug Doctor’s own entry into that particular market – more on that below). The Rug Doctor Deep Carpet Cleaner is the gold standard for carpet cleaner rentals. Now, for the price of a few days of rental, you can own one of these workhorses forever. This beautiful machine uses dual cross-action brushes to perfectly scrub away dirt and remove set-in stains. The scrubbing brushes clean each fibre from multiple angles, and the grooming brushes serve to polish up the carpet for a fluffy result. Compared to machines in the same niche as the Rug Doctor option, it has over 75% more suction, which leads to a faster clean and a shorter drying time. Per Rug Doctor’s website, the Deep Carpet Cleaner has been rated Gold for Best in Class Cleaning Performance by the Carpet and Rug Institute. The Rug Doctor will remove more dirt than comparable machines, and will not void your carpet’s warranties. The included Upholstery Tool allows you to clean furniture, upholstery and hard to reach areas. The Super Boost Spray option cleans high-traffic areas that need extra attention. Quick results leave your carpet smooth, bright, fresh and clean. Quick dry takes up to 4 hours. 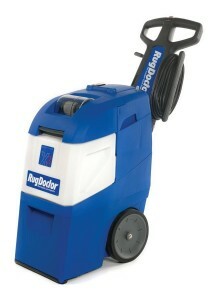 Use Rug Doctor cleaning solutions in the Deep Carpet Cleaner for the best results. In our full review of the Deep Carpet Cleaner, we noted its award-winning technology (it won a gold standard from the CRI) and raved over its cleaning power, fast drying, and user-friendliness. We wrote a full review of this little beauty, in which we praised its suitability for light work. I’d be perplexed if a pro turned up at my house intending to clean my whole place with this, but it’s perfect for spot cleaning, handling little messes and so on. Bissell are well known for their range of quality and high performing carpet cleaners and the Big Green is Bissell’s professional carpet cleaner model. It’s normally much more expensive than the Rug Doctor X3. So what does it have to offer? The Big Green is certainly a well-built model and the quality and robustness of materials make it feel like it will last for many years. It has a 1200-1400 watt motor, which is not that powerful compared to other upright carpet cleaners, but the big difference is in the cleaning brushes. The Big Green has a rotating front brush bar with 8 rows of brushes that gets deep into the carpet fibres for a better clean and also helps to improve the appearance of your carpet. The clean and dirty water tanks on this machine are huge compared to a normal upright carpet cleaner. The clean water tank is 8 litres and the dirty water tank is 9, so you’ll be able to cover a large carpet area before needing to fill or empty the tanks. When filled, these tanks add to the already heavy 19kg weight of the Big Green but manoeuvrability, whilst not on a par with smaller upright cleaners, is still easily manageable. The two tanks sit on top of each other and both feature a carrying handle for easier lifting. The cleaning hose on the Big Green is 2.8 metres long; which is a good job really as, when it comes to cleaning stairs, you’re unlikely to want to carry the Big Green while using the hose tool. The brush tool is very similar to other Bissell models and features three rows of small brushes and the hose screws easily into the cleaning water tank. The power cable is 7.5 metres so you’ll be able to move around with having to change sockets too much. A neat touch on the Big Green is that the handle can fold making it (slightly) more compact. Surprisingly for such an expensive machine, only a 1 year warranty is offered, although, as expected for Bissell’s top-of-the-range machine, the quality of the Big Green is unquestionable. So, the Bissell Big Green machine is a very good professional carpet cleaner, but given the choice we’d go with the X3 for the reasons given below. So how does the X3 compare to the Bissell Big Green? The motor is rated at 1400 watts – identical to the Bissell. The tanks, however, are much larger: the cleaning solution tank is 11.4 litres (versus 8 for the Bissell) and the waste water tank is 14 litres (versus 9 for the Bissell). With this water tank capacity, you can easily clean large rooms without having to fill or empty the tanks. The cleaning hose on the X3 is 3.6 metres in length, so again is longer that the Bissell’s 2.6 metres. The brush bar on the Rug Doctor also vibrates while cleaning to really get deep into the carpet fibres. To provide you with re-assurance about your expensive purchase, the Rug Doctor X3 also comes with a 5 year guarantee, which makes the Bissell’s 1 year warranty look pretty poor. As you can read below, the Bissell tries very hard but at the end of the day the Rug Doctor wins hands down. It cheaper, it’s better known, and it’ll go further on each clean water tank. If you are looking for a professional carpet cleaning machine, then the Rug Doctor gets our vote!